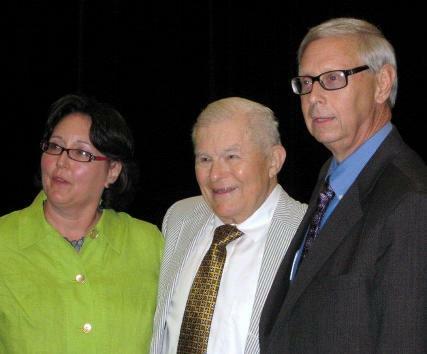 The Institute for Rural Journalism and Community Issues and the Bluegrass Chapter of the Society of Professional Journalists have established the Al Smith Award for public service through community journalism in Kentucky, or anywhere by a current or former Kentuckian. The award’s first recipient is its namesake: Albert P. Smith Jr., who owned weekly newspapers in Kentucky and Tennessee, was founding host of Kentucky Educational Television’s “Comment on Kentucky” and main founder of the Institute, whose advisory board he chairs. 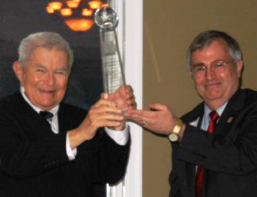 Institute Director Al Cross, right, presented the award to Smith in June 2011 at a dinner in Lexington. "No one in my lifetime has meant more to Kentucky, in terms of how he's communicated, than Al Smith," Lexington entrepreneur Jim Host told the crowd of nearly 200. Current "Comment" host Ferrell Wellman said, "No one has demonstrated how a rural journalist can influence a state more than Al. ... When I think of Al, the first thought that comes to me isn’t of a journalist, it’s of someone who loves life -- and that love is contagious." For Wellman's remarks as prepared for delivery, click here. David Holwerk, a frequent "Comment" panelist as editorial-page editor of the Lexington Herald-Leader, and now communications director for the Kettering Foundation, said Smith is known for talking a lot, but "Talking and listening, the gift of conversation, is always at the heart of Al’s work as a journalist. ... Inspiring, provoking and providing occasions for conversations like that is the job that Al Smith has assigned himself in this state. For more than 40 years, Al has been finding ways to get Kentuckians to talk and to listen to each other – to engage in the kind of conversations that will inform them before they act to deal with shared problems. He has done this while working as a journalist, but it sells Al short, I think, to call him just a journalist, or even a community journalist. That is not his true calling, nor really why we honor him tonight as the first recipient of the award that bears his name. We honor him for his dedication to a higher and more important role in the public life of this state and its communities." For Holwerk's remarks, click here. Smith's last "Comment" producer, Renee Shaw, reflected on a last visit with Smith to the town where he began his Kentucky career: "When Al walked the streets of Russellville that overcast October day, he was a rock star, but his swagger was humble and introspective. You could see the years of reflection flashing before his eyes. It was moving for me, and I realized in a new way, a more appreciative way – of the treasure Al is to Kentucky. A man dedicated to his craft in all its incarnations; to telling the truth and putting up a fight for it; and guiding generations of Kentucky journalists and public servants. That’s just a few of the reasons Al Smith is so deserving of this honor tonight, for four decades of uncompromising work, done quintessential Al style." For the rest of Shaw's speech, click here. In accepting the award, Smith said community journalism is "the canary in the mineshaft, the signal that things are wrong at the roots of our society, that air has gone stale and democracy is smothered." He said the Institute "turned on as the big city papers were turning off – closing their rural bureaus, firing reporters, and killing their state pages, all while claiming nothing was lost. Yeah, yeah, nothing lost but the news, the signals between city and countryside. If the canary dies, who would know it? Sixty million rural Americans, only 2 percent of whom are farmers, are really too important to be blacked out by modern media from the real world of the 21st Century." For his prepared remarks, which were about the last third of his speech, click here. In her remarks to the awards dinner crowd at Eastern Kentucky University's new Center for the Arts, Brown gave a clear picture of the fortitude and high goals often required be a good community journalist. "You have to be careful with friendships, and you have to tell the truth. And then you see the subjects of your stories in the toilet paper aisle at Kroger," she said. "Often, I learn that we don’t expect enough from people. I mean we don’t expect enough from our own journalists and from the people we cover. Setting the bar high usually works. I hate to see people at smaller papers accepting crumbs. If you don’t do good journalism at small papers —and doing good journalism includes filing open records requests and complaining when the open meetings law is violated —then you are telling people who live in rural areas that their place in life, in the world, is not that important." Heath established the editorial principles that have earned Landmark national recognition. He told the crowd that his work on journalism ethics and freedom of information was guided by the values of SPJ. For more from Heath, and more about the award, click here. “For 40 years, Al Smith has been an important fixture on the public-policy stage in Kentucky, holding the state, its officials, its institutions and its journalists to higher standards that we must achieve for the state to realize its potential.” So said the University of Kentucky in awarding him an honorary Doctor of Letters degree in May 2011. Smith is the first recipient of the journalism award named for him because he is a great example of public service through community journalism. His six weekly newspapers helped bring about school consolidation, new public libraries and community arts programs; create thousands of jobs; and keep rural hospitals open and independent. But unlike most weekly editors and publishers, he went beyond the county lines to play a major role in the public life of his state and region. He helped pass Kentucky’s first effective open-government laws; was federal co-chairman of the Appalachian Regional Commission under Jimmy Carter and Ronald Reagan; co-founded the Institute for Rural Journalism and Community Issues; helped start the Prichard Committee for Academic Excellence, the Kentucky Oral History Commission and Leadership Kentucky; and was chair of Kentucky Arts Commission, the Governor’s Council on Educational Reform, Leadership Kentucky and the Shakertown Roundtable. He is best known as the founding host of KET’s “Comment on Kentucky,” the oldest public-affairs show on a state’s public television network. 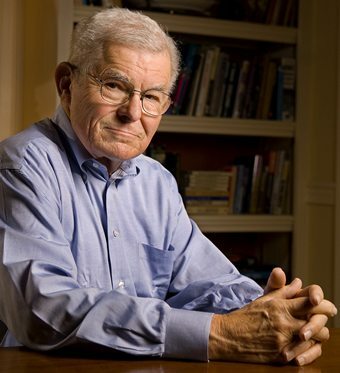 Smith is completing a memoir, but continues to write for major newspapers and remains active in public affairs. He remains a model of what he calls “the engaged journalist,” one who performs the necessary public service of accountability journalism but also plays a meaningful role in improving his or her community. For a 15 MB PowerPoint presentation on Smith's career in journalism and public service, click here. For one in the older version of PowerPoint, totaling 18 MB, click here. For an account of how he started his own paper, told at a recent reunion of former employees, go here.